It's that time of year again. Fall will soon be here (hard as that is to imagine when it's 100 degrees outside) and training programs for the AT&T Marathon and Half Marathon in Austin will be starting. There will be hordes of runners on Town Lake on the weekends. From the perspective of "health", it's great to see people out exercising. Unfortunately, this time of year also brings with it a plethora of running injuries. Since that's the case, this is the first of a three part series on running injuries. This is a very challenging time of year, though not for the reasons that you might think. 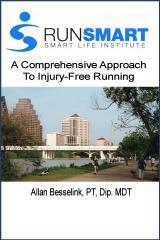 I've worked with runners throughout my PT career - which now amounts to 19 years of clinical practice. Over that time, I've seen treatment methods come and go. I've watched "the next great thing" rear it's ugly head more than once. I've heard the phrase "it works for everything" far too often (and as I always respond - "buyer beware"). Given all of the good sports science literature that is available regarding training and injury rehabilitation, I am amazed at how many runners are still fed up with the health care system. I would go so far as to say that the currently accepted community standard is lower than what we should expect based on our current sports science literature. People expect to be on the sidelines for a far longer time than they probably should - and that is the accepted "norm" these days. Hopefully we can clear the air about some of these issues over the next three weeks ... before marathon training is in full swing! The starting point for this discussion is "how do I know when I have an injury?" This is the oft-heard question from training group to training group. During the course of training, there are always going to be some aches and pains - but the important aspect is knowing "when to say when". During the process of training and recovery, the tissues of the body undergo transformation. The training stimulus gives the body a reason to adapt to greater demands. When the body's ability to adapt to these demands is less than the imposed demands themselves, an injury will occur. This doesn't include the acute episodes like a sudden ankle sprain on the trail or some similar traumatic issue! I would suggest that there are three primary questions that need to be answered. Is this problem limiting your training volume? Does the problem cause you to alter your running mechanics? Does the problem affect any of your normal day-to-day activities? If there is a "yes" to any of these, then it's time to consider the potential for injury - and time to address it effectively. Along with this is the difference between "hurt" and "harm". "Hurt" would be an awareness of symptoms that are not increasing during the activity and not remaining longer than 20 minutes post-workout. "Hurt" is generally an indicator that you are stressing the tissues but not causing any lasting damage to them. "Harm", on the other hand, would be an awareness of symptoms that are increasing during the activity and remain worse greater than 20 minutes after the workout is completed. The former would be an indicator to monitor the status of the tissues, to adjust training demands, and to emphasize other recovery-based aspects of your program (i.e. strength training, massage, nutrition, etc). The latter would indicate that further assessment may be warranted. Listening to your body is a significant part of effective training. Your body provides feedback to you - the task is to not ignore the messages! The first step to being an informed health care consumer is underway. Let's say you're thinking that you may have an injury and you decide to go to a health care provider for further assessment. Here's where the fun begins - and where the belief systems come into play full force and oftentimes over-ride good 'ole anatomy and physiology. We all know there is a huge chasm between "science" and "belief" - if in doubt, just ask Christopher Columbus if the world is flat. ... or any of a number of hypothetical scenarios that link one end of your leg to some remote injury site. If you critically examine the scientific literature related to the cause of running injuries, you'll find some stunning observations. Here's where I am going to sound heretical. Trust me, at this point in my career, I am not concerned about that. I'll rest my laurels on science and some good evidence-based practice. The sports sciences would tell us that there is but one definitive known cause of running injuries. Yes, one. Remember, this isn't beliefs or newfangled hypotheses about your SI joint, your tight muscles, or any other random clinical observation. The one cause? Your body is unable to adapt to the current demands of your training, and thus an injury is incurred. Or to say it another way - Training error. Or in a few more words - too much too soon. Is there any good scientific literature to support most of the current reasoning out there behind running injuries? Sad to say, but - no. Here's the worst of it though - most consumers aren't aware of this. The average person is a relatively uninformed consumer of health care. Patients come in with problems, and if the clinician isn't careful, the patient will leave the office with no solutions and just more problems. Take the example I presented above. If you were the runner with back pain, then not only did you leave with the original problem but now you've got this nasty overpronation, rotated hips, tight calf muscles ... and fear in your eyes. With all these issues, will I ever run again? It has the potential to take a motivated person and make them passive - and create a dependency on the clinician. And nowhere in the mix did anyone discuss their training, the primary cause of running injuries in the first place. Sad - but true. And therein lies a great part of the challenge at this time of the year. Welcome to my world. And welcome to marathon training season. In the next two articles, we'll discuss current treatment options for running injuries, and, better yet, how to prevent them in the first place.